Custom Screen Printing of Labels and Nameplates | Data Graphics Inc. Custom Screen Printing of Labels and Nameplates | Data Graphics Inc. Custom screen printing is a centuries old, and proven printing method that can applied to everything from labels to t-shirts, and everything in between. Before we delve into the specifics of the process, first let’s cover why Data Graphics will be your screen printer of choice, and make sure that screen printing is the appropriate methodology for your project. Why Choose Data Graphics as your Custom Screen Printer? 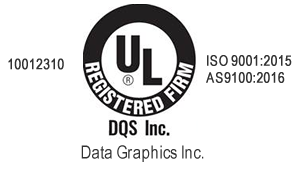 Quality – Data Graphics is an AS 9100, ISO 9001, UL Approved Label Printer. We are accustomed to meeting the exacting standards of the aerospace, medical, military, OEM and telecommunications industries. Speed – Call 800-639-4316 now for an Insta-Quote to see how fast our process is. We are an industry leader with turn-around times of 2-10 working days, and more than 60% of our custom screen printing projects are done ahead of time. Problem Solvers – Our staff is extremely helpful and experienced, with hundreds of years of collective screen print experience. Our sales engineers are the friendliest and most helpful in the industry. We know how to solve screen print problems, and bend over backwards to help our clients solve their’s. You won’t find a screen printer who you like working with as much as Data Graphics. Confidentiality – We are an ITAR Registered (International Traffic in Arms Regulations Compliant) firm which adheres to the highest standards of security and confidentiality. Size – We are large enough to have many of the latest and greatest machines, but small enough that customers aren’t numbers, but valued clients. Trusted – Data Graphics has a hard-earned reputation to uphold as the nation’s top quality screen printer. The firms that trust us with their label and overlay business reads like a “who’s who” list of Fortune 500 Companies. More than 80% of our customers repeat order. You can read more about our satisfied screen print customers here. Getting it right the first time – Every step along the way our team double checks the work done prior, and we regularly catch tiny errors that even our clients miss. Versatility – We have done custom screen printing on almost everything imaginable. Our Data Graphics division focuses on industrial labels and nameplates; for uniforms, shirts, and promotional items, please consider our sister company, DG Promotions, a leading custom apparel screen printer. Excellence – Our custom screen printing team is…how shall we say it…a little OCD. I know it is hard to imagine being obsessive about labels and overlays, but our screen printers are so committed to excellence that they catch slight errors in color, registration, and coverage that most clients would never notice. That’s why we average 99% approved order rates. Cost – Screen print is a cost effective solution, especially for larger runs. Style – Screen print has a traditional, vibrant look, and the colors are bolder than other methodologies. Coverage – No other methodology provides as complete, opaque, and solid a product. A screen print never produces the pixilation sometimes seen in digital printing. Versatility – Custom screen printing can be effectively done on an enormous variety of materials. If you are interested in apparel or promotional product printing, please visit our sister company, DG Promotions. We regularly screen print on vinyl, polyester, Mylar, aluminum, Lexan, acrylic, Plexiglas, Marnot, Protek, Styrene, Markrofol, MACTAC, fish paper, foil, polycarbonate, and Autotex. If you are unsure which materials are the best choice for your custom screen printing job, please call our helpful sales engineers and let them find the right materials for you. Durability – If your label is going to be exposed to the elements, saltwater, abrasions, chemicals, wear and tear, or intense UV exposure, let our team help you find a more durable label solution, such as Metalphoto ®, or engraved/etched aluminum labels. Size – A screen print can only be as large as the screen, or 30” by 30”. Any larger print projects would be better suited to one of our digital printers. Color Subtleties – For all of the color vibrancy that screen printing provides, it lacks the full-color gradient and fades possible with digitally printed labels. To reproduce a photo, only a digital printer will do. Serialized Labels / UID’s – Sequential labels, serialized labels, or labels with UIDs would require a different screen for each label, which is unrealistic. Instead, a digital printer, Zebra printer, laser or digital engraver would be better solutions. Extremely Fine Detail – A good screen printer will always advise that extraordinarily fine detail may be better captured on a digital printer. Speed – many projects, especially multi-color projects can be done faster on a digital printer. Screen printing has existed in some form since China’s Song Dynasty, but really came of age around 1910, when photo-reactive chemicals were used to bind emulsions to the silk screens. The compounds and chemicals we use at Data Graphics are much more environmentally-friendly, but the process is little changed since then. We stretch our own screens, cutting down on costs and never leaving us waiting for a third party provider. We even recycle when we can. While the term “silk screening” is still very common, in truth, screens have been made almost exclusively of polyester for the last few decades. The thread count of the mesh screens we use is wide ranging, from 80 to 390. Thread count is important to a screen printer. Let’s use a 200 thread count screen as an example. That means that each square inch of the screen has 200 vertical threads and 200 horizontal threads, essentially creating 40,000 tiny “windows” between the threads which allow the ink pass through. A lower thread count has fewer, larger “windows” per square inch, thus allowing more ink to pass through each. Having a wide range in thread counts allows our team to pick the appropriate thread count for the ink, material, and project at hand. In a dedicated part of the facility, free from debris and much foot traffic, we prepare and burn our screens. An emulsion, a gelatinous, glue-like substance, is applied evenly over the screen. A stencil is formed by blocking off parts of the screen in the negative image of the design to be printed; that is, the open spaces are where the ink will appear on the final screen print. This is “burned” onto the screen, using a ultra-violet light. The remaining emulsion is washed off the screen mesh. The screen has effectively now become a screen print stencil for one color of the print job. Each color must have its own screen “burned.” We have a small team who can stretch and burn screens, with decades of experience between them. Next the color are mixed and tested on the materials. This would seem to be a relatively straightforward process, since we, like most printers, utilize the Index of Federal Standard Colors, as well as the Pantone and REL color charts. The same color ink, however, can look quite different on various materials and with different finishes. We can use any inks, from flat to high gloss. Color computers simply cannot compensate for material, finish, and lighting. Instead, Data Graphics relies on Tim and his team of color experts. Tim has more than three decades of experience in printing and has been the color guru for as long as anyone can remember. Tim is universally respected within the company because he is simply unrivaled at his job. No project gets run through the presses until Tim and his team are comfortable that the colors on the sample run are perfect. As we mentioned earlier the actual process of screen printing is little changed over the years. Essentially ink is spread evenly across one end of the screen mesh. The mesh is lowered to just above the substrate (the material we are printing). Using even pressure, a squeegee draws the ink across the stencil, pushing the screen onto the substrate and forcing small amounts of ink through the mesh and onto the substrate. A screen printer can either underprint on the bottom of the label using clear or translucent materials, or overprint on the top of the label, using opaque materials. Different types of inks are used depending on the purpose and the material used. Some inks are dried using heated, blown air, and others are through UV exposure. The process is repeated for every color. Often times a clear protectant coat is applied over the top, much like a protectant clear coat on a vehicle. Data Graphics has four automated screen presses and three manual presses, two blown air dryers and two UV dryers. Each is capable of handling thousands of screen print jobs per day. This redundancy helps ensure that projects never get held up too long in production. The most common error screen printers encounter are “pin holes,” tiny points where the ink did not cover the substrate. This can be caused by a defect in the screen, most commonly a tiny piece of debris that got into the screen mesh somewhere along the way. It is also possible the debris or grease found its way to the substrate. This is why cleanliness is so important to the screen print process. Our screen printers meticulously clean their machine and work places after every run. In fact, many of our vendors remark that ours is the cleanest print shop they have ever encountered. Another cause of “pin holes” is ink thickening. Some inks air dry quickly. Some print jobs are time consuming. Either way, as the consistency changes, the ink may not press through the “windows” of the mesh properly. An experienced screen printer can identify this and easily fix it. Our screen print crew is headed up by people with decades of experience and familiarity with every type of ink imaginable. This is something our team is adept at avoiding. To check for “pin holes” and other imperfections, our crew examine the labels using backlit exam tables and jewelers loops. Yes, they really are perfectionists. The other common problem screen printers encounter is a breakdown of automated presses. For many a screen printer, this would grind screen print operations to a halt, and delay projects. In response to these challenges, Data Graphics has Earle. He is the mechanical guru devoted to the routine maintenance and repair of all of our machines. Between our machine redundancy and Earl, you will never be left waiting on a custom screen printing job. There is a reason Data Graphics has been the screen printer of choice for so many important firms for so long—we have unsurpassed quality and unrivaled customer service. We would love to help you on your custom screen printing project. Please call us at 800-639-4316 and begin to discover the Data Graphics Difference.